Gunduwa is the local Badimaya name for the echidna. These extraordinary ancient egg-laying mammals suckle their young and, along with platypus, are the only surviving monotremes. The Gunduwa Regional Conservation Association (GRCA) was first proposed when Mount Gibson and Extension Hill mines were required to provide resources to help offset their environmental impact (contained in Ministerial Statement 753). Gunduwa was formed to enable members working on conservation initiatives to achieve more together, over a larger area, than they could working alone. 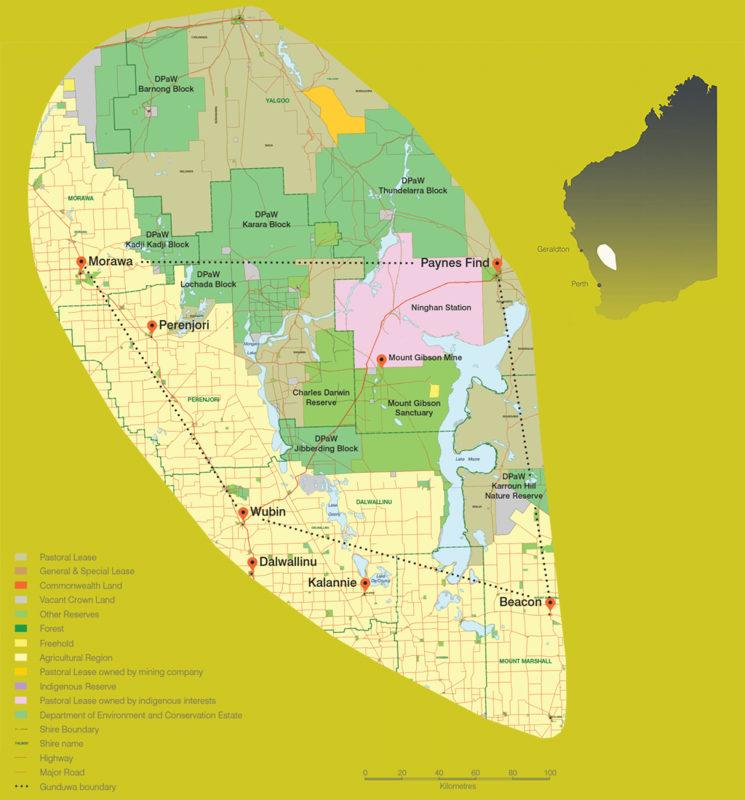 Ministerial Statement 753 defines the region in the northern Avon Wheatbelt and Southern Yalgoo IBRA bioregions generally focusing on the area bordered by Beacon, Wubin, Morawa and Paynes Find. The region contains the botanical transitional zone between the woodlands of the wheatbelt and the expansive mulga zone of the interior. The Great Northern Highway between Wubin and Paynes Find transects country rich in natural diversity – farms, pastoral lands, woodlands, salt lakes, shrublands, and the banded iron and greenstone hills of the surrounding rangelands. Thanks to the following groups and organization for their invaluable support in assisting with the formation and continuing development of Gunduwa.